One of the biggest things I crave, after having gone gluten-free, is pizza. Seriously, it’s like a little bit of an obsession to get my hands on a slice of yummy, cheesy goodness. But no. No, no, no, no–NO. Upset tummy is not ok. But, making a Gluten-Free and Vegan Calzone? That’s more than ok. That’s awesome. And while it’s baking, cleaning the kitchen so it’s nice and sparkly? That’s just out of this world awesome. 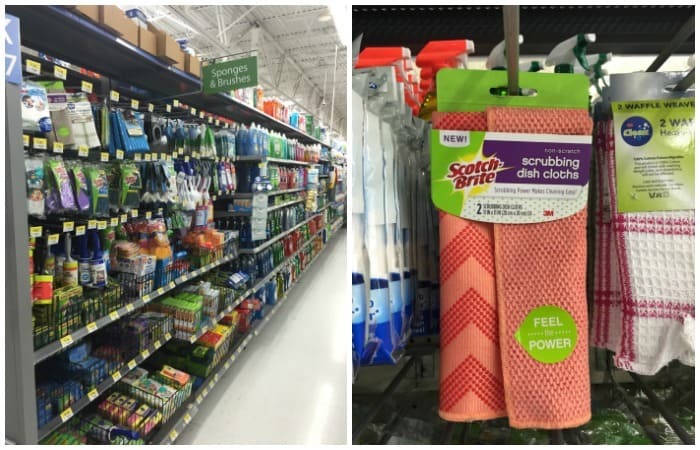 Even going to the extent of using my DIY Disposal Cleaning Bombs and hand-washing the ewey-gooey stuck-on dough from the bowl with the new Scotch-Brite® Scrubbing Dish Cloth (not just “new to me,” but NEW as in–“brand new product that’s genius”)? Well, now I’m just in freakin’ heaven. Heh. 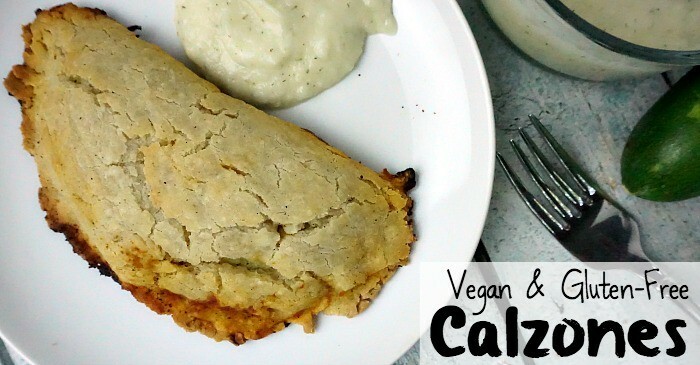 Don’t get me wrong, this Gluten-Free and Vegan Calzone Recipe is not a slice of yummy, cheesy goodness. No, it’s better than that. Because, frankly, the actual idea of cheese kind of squicks me out anymore because of how upset my stomach gets. But to have those flavors swirling together? And a crunchy, stiff crust with mushrooms…man I wish I’d made a double batch…so good. And the fact that my dish cloth and DIY Disposal Cleaning Bombs had the kitchen squeaky? Well…I kinda had the best day ever. Ever. LOL! Here’s a little photo tutorial for making the bomb bombs. Because they’re really simple. But genius. So, here’s what you do in words (because if I were you, I’d need words, heh). 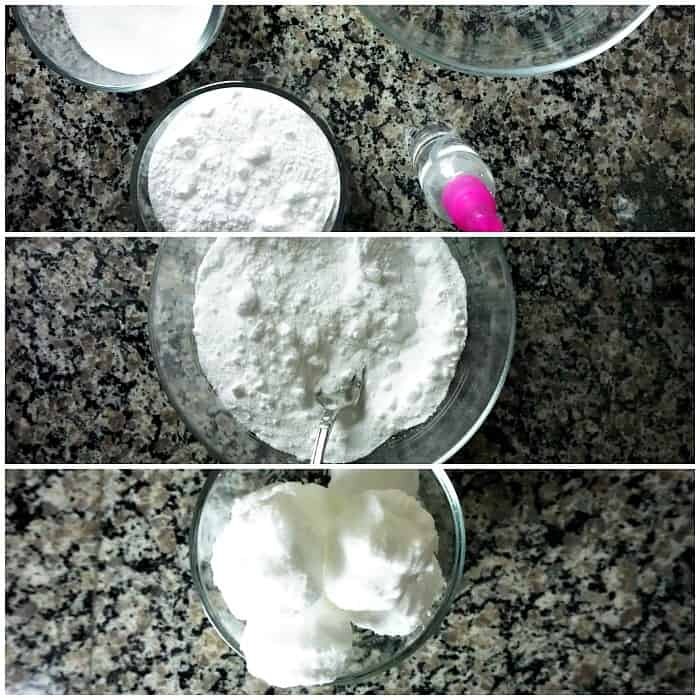 Mix 1 cup citric acid and 1 cup baking soda together in a bowl. Gently squirt with a little water until it’s moist (but not so much that it foams. Form into balls and set aside to dry a little. 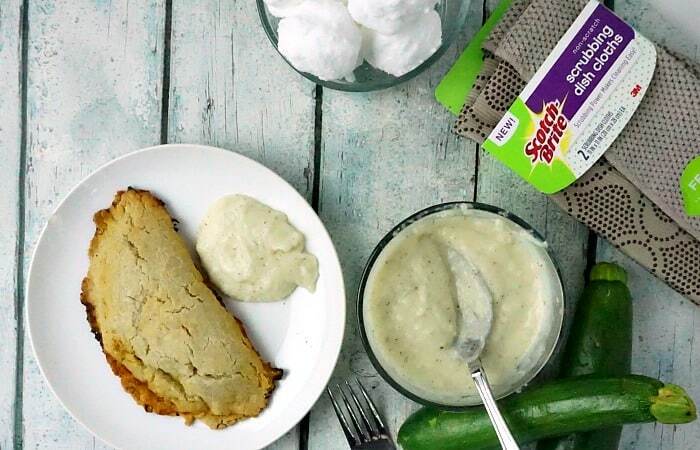 While that’s drying, get your Scotch-Brite® Scrubbing Dish Cloth into the mix. Why this? Well, frankly, after I’ve cooked, there’s always a huge mess. And when I’m cleaning, I end-up with stuck-on messes that have to really be scrubbed…and my nails can only take so much of that. So I end up soaking forever and then it’s really ick…No more. 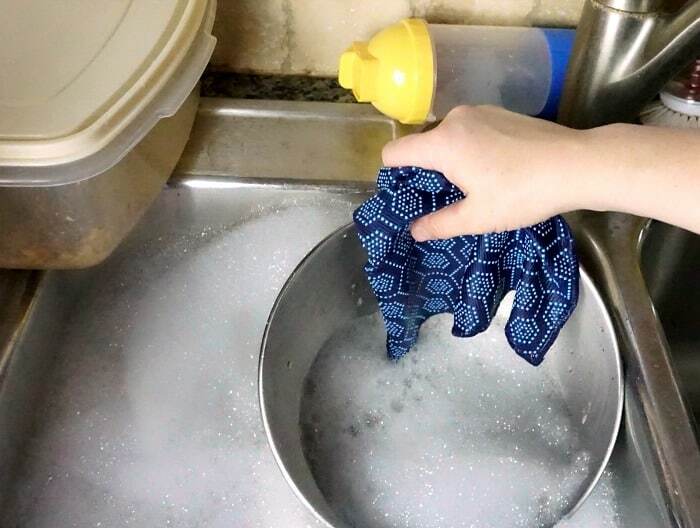 The Scotch-Brite® Scrubbing Dish Cloth has the dual-capability of being a dish cloth AND having gentle little scrubbers that don’t scratch, but totally give you the scrubbing power necessary to get those messes un-stuck and gone. Heh. I picked-up 2 2-packs (and got an in-store $1 off each 2-pack at the register) in beige and navy blue (although they also have coral, but I’ve got a whole brown and blue motif anyway). Found them in the cleaning-stuff aisle…you know, with the other stuff that cleans?! LOL! Running with scissors? 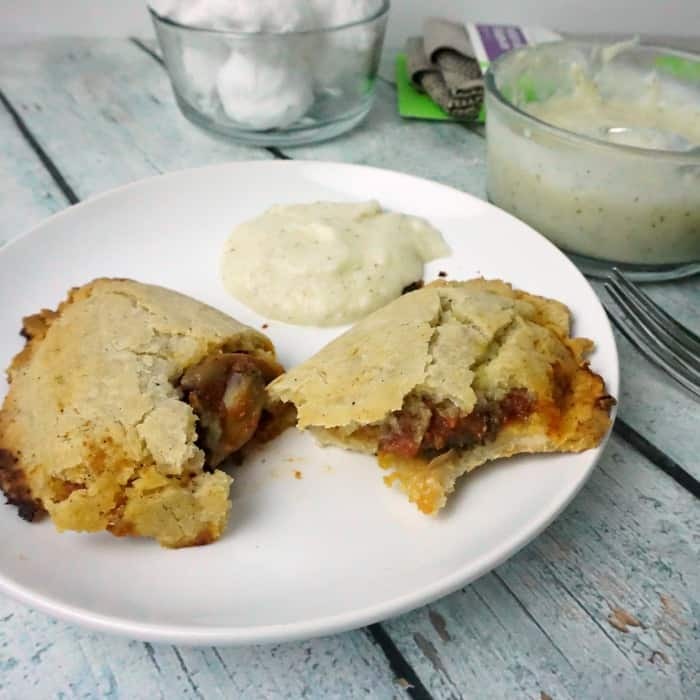 Here’s your photo tutorial for the calzones of awesome. Place your baking pans into the oven and allow them to preheat with the oven. Mix yeast and water together and allow to stand for 10 minutes. Add salt, 2/3 of the olive oil, and flour, mixing until dough pulls away from the sides of the bowl. Divide dough into 4 equal balls and drizzle each with 1/4 of the remaining olive oil. Flatten each ball into a 1/4 to 1/8 -inch thick circle (roughly). On one half of each of the dough-circles, layer 1/4 of the stuffing stuff. 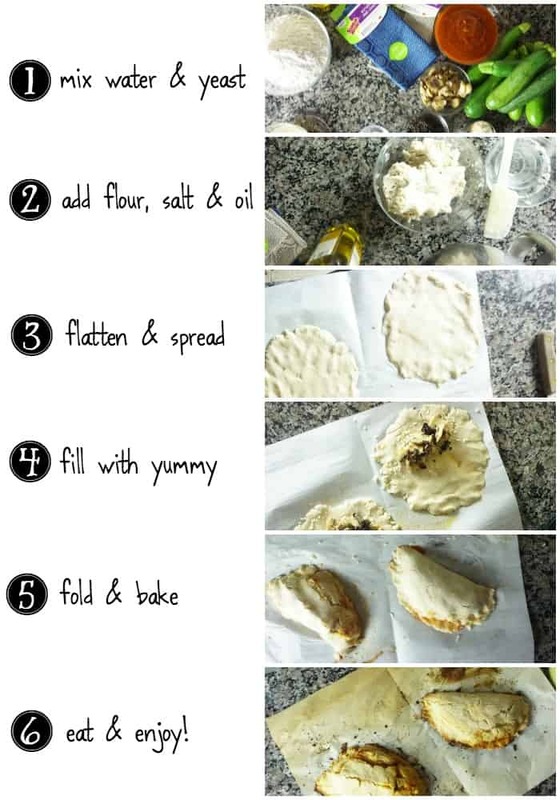 Fold the dough over (I found this to be easiest to do when lifting the parchment paper they're on and folding it over...then removing. Remove pans from the oven and place the calzones onto them. Place back in the oven and allow to bake for approximately 15 minutes, or until the top is nicely browned and crisp. And for those of you more sane than that…here’s the wordy-word recipe. Heh. You can totally check out lots of other great recipes and cleaning tutorials here. And, remember you get that $1 off instant redeemable coupon for the Scotch-Brite® Scrubbing Dish Cloth at the register when you checkout. And since they’re only $4.98 at Walmart, that’s kind of a steal. Heh. 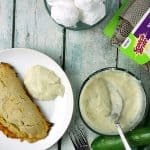 If you have any great ideas for yummy stuffing ideas to add to my Gluten-Free and Vegan Calzone recipe or any other awesome ideas for using my Disposal Cleaning Bombs, let me know by dropping a comment below.